While the government has succeeded in isolating its most vocal opponents, the opposition itself is driving other activists away due to its lack of organization. 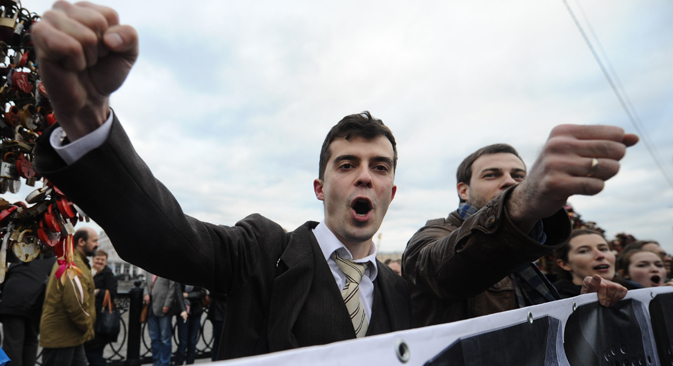 The Russian opposition held a rally on May 6 to mark the anniversary of last year’s mass protests at Bolotnaya Square. The protests in 2012 involved violent clashes with police and resulted in the arrest of 400 protestors, a few of whom remain in custody. According to police, around 8,000 people turned out for the most recent rally, although organizers cite a more optimistic estimate of 30,000 protestors. The rally was organized by the opposition Coordination Council – a structure that emerged last September and whose members were elected through online polls. The role of the Coordination Council (CC) is to represent the Russian opposition as a whole and engage in a dialogue with the government on behalf of the opposition. In Peskov’s opinion, the regime’s opponents have failed to come up with a constructive agenda or any true leaders. In the six months since its inception, the members of the CC have been mainly busy holding regular meetings to discuss organizational matters and issue statements on various actions of the government. According to Boris Kagarlitsky, Director of the Institute of Globalization and Social Movements, the establishment of the CC has become a symbol of the impasse in which the protest movement has found itself. “The leaders of the protests were aware that they were beginning to lose supporters and that they were unable to set new objectives. That’s where the Coordination Council election campaign came in,” Kagarlitsky said. The CC’s inability to set clear-cut objectives has led some prominent members to become less involved. Poet Dmitry Bykov, one of the stars of last year’s opposition rallies, has essentially focused on journalism and artistic activities that are only indirectly related to political struggle. And the recent marriage of TV celebrity Ksenia Sobchak was perceived by many as a sign of her withdrawal from political activism to focus on her personal life. While CC members were holding meetings, the government was actively trying to isolate some of its most active members and reduce its potential impact on society. Several opposition leaders have become suspects in criminal probes launched with regard to either their political activities or alleged economic crimes. In particular, a court in Kirov is hearing the case of opposition leader Alexei Navalny, whom law enforcement agencies have accused of fraud. Navalny has become famous for exposing corruption in the highest ranks of the government. Another CC member, leftist activist Sergei Udaltsov, is under house arrest after being accused of accepting money from the Georgian special services, which was allegedly recorded by hidden cameras. Udaltsov has also been essentially deprived of participating in political activity. Journalist Oleg Kashin admits that many in the opposition have recently lost interest in the organization. However, according to Kashin, despite the ‘flickering’ nature of its activities, the CC still represents the opposition. He believes that it is the CC that would be able to start a dialogue with the government if a domestic political crisis were to arise. Kashin believes that Navalny remains the best person to lead such a dialogue on behalf of the regime’s opponents. “Unfortunately, it has become clear in recent months that he sees the role of a real political leader as a burden. Perhaps the Kirov trial will galvanize him,” Kashin said.